Don't feel like you need to miss out on the perks of a vacation because your budget won't let you take a break. Sometimes all you need to boost your mood is an escape from reality. 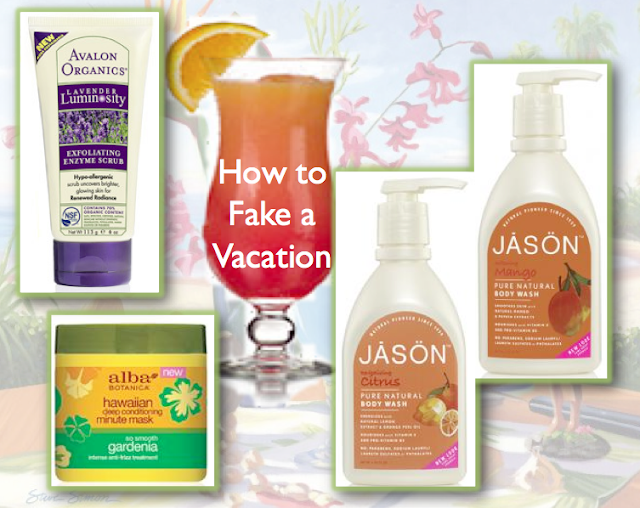 Check out our vacation inspired picks to pamper yourself during this stressful time of year. Soak up a healthy dose of citrus in these deliciously scented body washes. They are free of Parabens, Sodium Lauryl/Laureth Sulfate, Petrolatum, Artificial Colors and Phthalates so trust that you can bathe cleanly, without added harsh chemicals or preservatives. Forgo the tribal polenisian maks and instead, live up a tropical retreat with this Hawaiian conditioning mask. This deep conditioning mask reaches every strand of hair with its weightless moisture turning hair from dry and brittle to silky and smooth. Mango, Papaya and other tropical extracts nourish hair for a healthy boost and beautiful bounce. So you didn’t get a natural exfoliation from a sandy beach, but you don’t have to suffer with rough, dull skin. We love this scrub because you can slough away flakey, dead surface cells to uncover skin that is soft, smooth and vibrant. Fruit enzymes, finely ground Walnut shell and soothing, calming botanical extracts such as Pumpkin Seed, create a gentle but effective exfoliation that won’t burn or irritate skin.